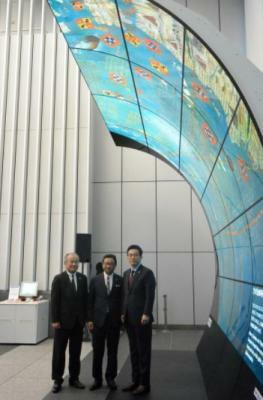 JR Kyushu announced that it will install Japan's largest OLED signage, at Hakata Station in Fukuoka early next year. The sign is a curved display made up from 36 OLED TV (55") panels produced by LG Display. The whole sign is 4 meters high and 7 meters wide, designed in a curve that seems as if the viewers are enclosed by the image. The display was jointed developed by Dai Nippon Printing and LG Electronics Japan. We have visited Fukuoka a few months ago (to participate in the TADF workshop) - it will be great to see this new OLED sign next time we are in Hakata Station. Japan's current largest OLED sign is the 9.6 x 1.9 meters Diamond Vision OLED display installed by Mitsubishi in Narita Airport in 2012. Isn't this JR instead of KR?